Welcome to the online collaborative wikisite of The Peripatetic University - Prifysgol Y Treiglo. A repositary of online workshop tutorials. We invite multidisciplinary collaboration, writing experiments and teaching between poets, text artists and interested others. The Peripatetic University/ Prifysgol Y Treiglo is a nomadic college of experimental writing and Summer school seminar series. We offer mobile seminars, walking conferences and travelling workshops. With an interest in walking poetry, psychogeography, processual poetics and cut-up procedures, lessons take place on the hoof, our campus is in cafes, pubs, markets, shopping arcades, public lavatories, train station foyers. If you know where to find it, the university will be there. As 21st century poets we inherit an array of poetic devices from twentieth-century experimentation. In addition to the traditional toolkit of rhyming, rhythmic and phonological effects, we have a plethora of processual, procedural, conceptual and performative approaches: ways of circumventing conscious intention, defamiliarising expectations and disrupting syntax to form new connections. In the seminar-workshop held in Llangattwg, we considered the many reasons for using such methods, the different experiences engendered, and what it's like to engage with such work as readers and writers. 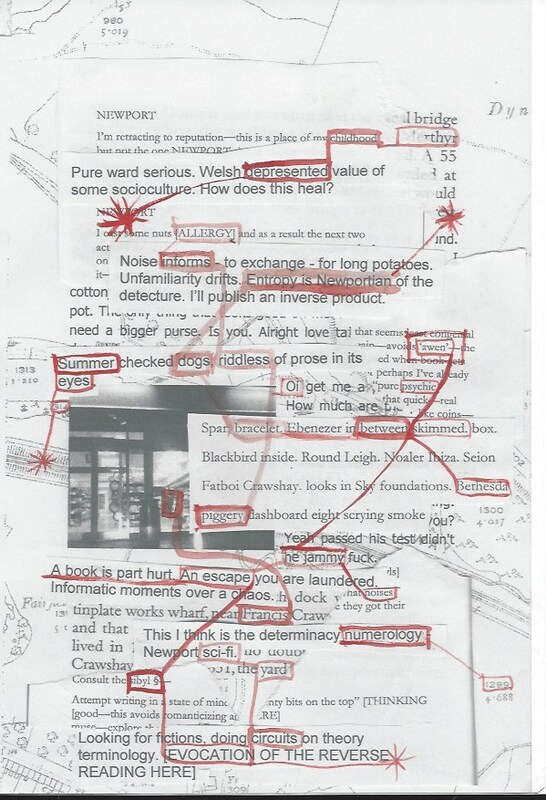 We began by looking at the development of the cut-up technique: from Tristan Tzara and Hans Arp’s use of chance in circling words at random in a newspaper or cutting them out and drawing them from a hat; to the developments made by William Burroughs in slicing and folding whole pages to create multi-spacetime narratives. We then moved on to the broad variety of playful conceptual mechanisms devised by Bernadette Mayer in her list of writing experiments and journal ideas: systematic translations and transformations and the performative frame of durational constraints. In the second half we considered the use of spatial parameters in the psychogeographical dérives of the Situationist International. The seminar will combine critical discussion and practical activities, culminating in a writing walk around Llangattock.